Rachel Scott was the first victim in the Columbine High School shooting spree. In her journal, she had written, “I have this theory that if one person can go out of their way to show compassion then it will start a chain reaction of the same.” By reflecting on Rachel’s essays and journals, her family learned of Rachel’s wish for people to be kinder to one another. On May 21, 2011, students at the Laredo Independent School District (LISD) began taking part in Rachel’s Challenge, a program that encourages daily acts of kindness. These acts are written down on separate pieces of paper and linked together to form a chain. 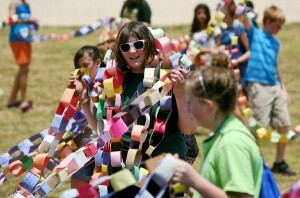 The year-long program yielded 176,751 links, enough to go around the track two-and-a-half times. In total, LISD student body had gone out of their way to be nice, kind and compassionate an average of 655 times a day throughout the school year. Schools in 48 states now participate in Rachel’s Challenge. Thankfully, after centuries of accepting the problem as a normal part of growing up, schools, parents, the media, and students are taking action to end bullying. LISD leaders say Rachel’s Challenge was a catalyst for change. Dr. A. Marcus Nelson, Superintendent of LISD points out that incident of bullying, fights and all other discipline issues decreased during the Challenge. “We have a responsibility today to bring out the best in our students, and to perpetuate that for future generations of students,” said Nelson. Conducting research for this post has inspired me to call my daughter’s high school and insist they accept Rachel’s Challenge or a similar program. Teenagers get a bad rap, but I have found that their capacity for empathy and kindness is greatly underestimated. You don’t have to be a teenager to participate in Rachel’s Challenge. You can start a kindness chain right here and now. You can track the chain reaction you start as it goes local, national and even global. What a beautiful legacy to kind soul.